Mosaic Cuisine would like these four events to be guest-focused, intimate dining experiences, so we will present a fixed-price menu to order from based on healthy seasonal and local foods. Thierry’s philosophy is that food and dining are opportunities for enjoyment of food and wine and the pleasure of sharing an evening with good friends, so exquisite attention is paid to creating an ambiance dedicated to the pleasures of dining. Best of all, each of these dining experiences features a short talk by Thierry before dinner, during which he'll tell us about his recipes and the challenges of preparation! The fixed price for each dinner is $55 per person, including one bottle of wine for every two diners, chosen from our selection of fine wines, or $45 without wines. Participation is by reservation only. Reservations for the Spring Fine Dining Event can be made by calling Mosaic Cuisine at 301-468-0682. The bf and I were starving the other week, so we decided to try Mia's Pizza on a whim. Its located in downtown Bethesda with metered street parking and metered garage parking. The restaurant is also accessible by metro on the red line via the Bethesda stop. The exterior is simple but very inviting, and I love the outdoor dining option for the approaching warm weather. I love enjoying a meal outside when the weather is beautiful. The interior is quite small. This picture shows pretty much the entire space minus the bar and foyer. I love the high ceilings, the soft lighting, and the clean lines and paint colors. It's a causal restaurant with a splash of elegance. The bar is a nice spot to grab a glass of wine, get a quick meal, or even a place to relax and catch on the the day's news. In the foyer there were a bunch of awards from local papers and magazines. I actually heard about the restaurant after reading it on the Downtown Bethesda Guide. Sorry for the dim pics... oh the soft lighting. Ok, onto the good stuff! Even though it's called Mia's Pizzas, they offer some other entree options. The bf ordered their 'Meatball Sub - Hot Italian meatballs, marinara sauce, melted fontina cheese on a hoagie roll' for $9.95. The sub came with a small side of salad too. He said it tasted good and high quality, but was small. I ordered one of their wood fired pizzas, 'Alsace - Pancetta, gruyere cheese, parmesan, caramelized onions & thyme' for $12.95. I actually loved it a lot! I think it was the flavor combinations between the salty pancetta (similar to bacon), the sweet caramelized onions and the freshness of the thyme. I thought the dough had a nice chewiness, and I enjoyed the crust, which is my least favorite part of any pizza. The server also came by to grate fresh parmasean cheese over the pizza. I was only able to finish 3/4 of it, so I took the last bit home. This is what it looks like close up. Some advice, don't reheat it in the microwave regardless of how hungry you are because it ends up really chewy. The 13 pizzas are all made in a wood fire oven and only come in one size, which is pretty much a personal size. They offer calzones, sandwiches, salads and appetizers between $3.50-12.95. I wished they offered complementary bread and dipping olive oil, but you can get it on the menu for $3.50. Cupcakes are offered on their dessert menu, which is a neat idea. The prices are a bit pricey for a small pizza and small sub, however the quality is high, and $25 for 2 is awesome. The other night my bf and I decided to grab some Chinese food at Joe's Noodle House. There's been a buzz about this place for being an awesome Szechuan style restaurant, so we decided to try it. Its located on the side of a shopping center off Rockville Pike (across the street from Congressional North Shopping Center) and has plenty of free parking. The closest Metro stop would be Twinbrook on the Red line. I thought the sign was cool because it was written in both Chinese and English. However it just says Noodle House. Where's Joe?! There were many awards and articles plastered on the windows and foyer of the restaurant, so you can't go wrong with a place like that! The interior was bright with red walls, and mirrors to make it appear larger. The place wasn't huge, but there were a lot of tables inside. It was pretty crowded when we came in. Notice the "Please Order and Pay Here" sign above the counter. Basically when you walk in they show you to your table, hand you menus, and when you're ready you walk up to the front to order and pay before you eat. I didn't know what to expect from this place since you're can't see the inside through the windows very clearly, but it's a normal-looking Chinese restaurant with a very diverse crowd of people dining there. I loved the bright lighting for my camera's sake. Onto the food! The menu is HUGE!! Not including beverages or the lunch specials, they have 212 items to choose from! (Yes, I actually took the time to count, haha.) Besides being well-known for their Szechuan style cuisine, they are known for having many exotic dishes. You can order Chicken Gizzard, Pork Liver or Kidney, Beef or Pork Tripe, Pork Blood, Duck Feet or Tongue. The bf and I decided to be like Andrew Zimmern from 'Bizarre Foods' on Travel Channel and try something that we aren't familiar with. We chose 'Duck Tongues with Basil' for $6.95. The dish came out really fast, and there were about a dozen tongues on the plate. FYI, this dish is served cold, which surprised me when it came out. 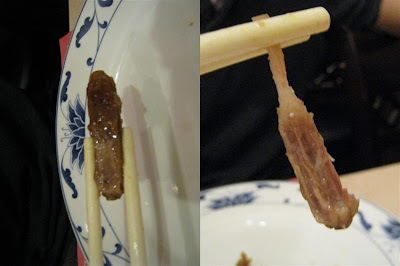 If you ever decide to try duck tongue do not chomp down into one because there's cartilage/bone in the center. I found that out by chomping, haha. There isn't much meat on it but its something different to snack on before your entree comes out. The basil and peppers mix was nice, and a little spicy. I was trying to get over the cold tongue idea while eating it, so I'm not sure if I'd get it again, but if you're not squeamish then you should try it. The pic isn't of the same piece, but its to show the outside and inside of a duck tongue. The bf ordered the 'Stir-Fried Sliced Pork with Hot Pepper and Leak' for $8.95. I think he enjoyed it since he finished the whole thing. The only thing he mentioned was he wished it had more pork in it. I ordered the 'Moo-Shu with 6 Pancakes w/Beef' for $9.75. I thought it tasted good, and the sauce ties the dish together when rolled up in the pancakes. There was egg, cabbage, carrots and other things I wasn't sure of. I also wished there were a bit more beef since it was mostly cabbage. The pancakes were really good and warm. The brown sauce was really good, and I kind of felt like I was eating a Chinese fajita as I was rolling it up. 6 rolls is a lot of food for me, so I only ate 4 while letting the bf have one and taking the rest home. I just wanted to mention that I love free tea! You do have to order it at some places, but it was cool that they give you a large pot right when you sit down. My fortune wasn't anything special because I don't remember it, but I do enjoy getting a fortune cookie at the end of a meal at a Chinese restaurant. I thought the staff was very nice and friendly. Very laid back and casual place with a huge menu at very reasonable prices. The most expensive dish on the menu is $14.95. Next time I'd love to try the noodles since it is called 'Joe's Noodle House' so I'm sure they're delicious. If you go to the website they have a coupon for 10% an order of $20 or more Monday-Thursday. Hi everyone! For me and my cousin's belated birthday, her mom took us to The Great Sage in Clarksville, MD. I know this isn't part of the DC Metro area (as in accessible by subway), however it was my first Vegetarian restaurant, so I figured why not write about it! It is has been in business since 2004 and is located in Clarksville, which is close to Columbia, and nestled in the 'Conscious Corner' shopping center that has The Great Sage restaurant, an organic market, healthy pet food store and organic clothing/gift shop. I like how there is cute outdoor seating for when the weather is nice. The interior is quite beautiful with its rich colors and mood lighting (which kills my food shots, but ce la vie). I liked the simplicity of the decor along with the paintings, which gave a nice touch. I decided to drink something other than water, so I ordered the 'Black Cherry Carbonated Juice' for $2. It was pretty good for not having any added sugar in it. While waiting for our food we were presented with some white bread slices to dip into our olive oil and herbs mixture. We ordered 2 appetizers. Our first was the 'Falafel Griddle Cake - Chick pea and wheat bran cake served with tomato-cucumber relish and a Tahiti sauce. (V)' for $6. The texture of the falafel wasn't as crunchy as I've had it in the past because I've had them fried. I enjoyed the taste of all of the ingredients together. It tastes very healthy, if you know what I mean. Our 2nd appetizer was the 'Santa Fe Salad - Young mixed lettuce, black beans, roasted corn, red onion, plum tomato and avocado with house made lime cilantro dressing topped with crispy tortilla strips and choice of marinated tofu or cheddar cheese. (V Opt, GF, SF Opt)' for $7. We ordered the side salad, otherwise a normal sized one would be $10. We put both marinated tofu and chedder cheese on ours, and I thought it was quite delicious. For my entree I ordered the 'Oaxacan Tamale - Steamed tamale filled with an Oaxacan style mole and seitan over red rice and green chili sauce. (V)' for $16. I'm a huge fan of tamales, so I wanted to give this a shot. It was actually really good for having no meat in it because the mole and green chili sauce were very fragrant and tied the whole meal together. My aunt ordered the 'Seitan Wellington - Marinated seitan, truffled mushroom duxelle and spinach baked in pastry with a red wine mushroom demi and whipped gold potatoes. (V,SF)' for $18. I tried the baked spinach/pastry part and it was SO GOOD. They have an in house pastry chef, so it tasted very homemade. FYI - Seitan is a product similar to tofu, however it is made from wheat gluten instead of soy giving it a chewier texture. My cousin ordered the Night's Special, which was '"Green" Gumbo - Okra, Tomato, Garlic, Green Chile, Poblano Pepper, Onion, Creole Spice, Swiss Chard, Roasted Corn, and Brown Rice (V, SF, GF)'. I don't know the price since it wasn't on the menu, and my aunt took the check away from us to pay. I did try Gumbo and we both found it to be a bit bland, so she asked for some hot sauce and these are the options they brought out. We were all so full that we didn't order any dessert, however our server said the restaurant would be happy to give us a 1 oz nightly sample dessert on the house, and it happened to be chocolate mousse. How awesome! Overall, I had great service in a warm, beautiful, laid back place. I personally don't mind eating Vegan or vegetarian food, but it does have an acquired taste. If you are not open to the fact that a vegan tamale will not taste like a regular one, then perhaps this place might disappoint. If you are open to this type of food, then its really delicious. Great plate presentation, and you can tell a lot of time and thought goes into the dishes. The menu changes all of the time depending on what is in season and the price range for the entrees are between $13-$18. A few weeks ago I went to Plato's Diner in College Park, MD in memory of my late friend D.Ellis. During our junior year of college he passed away in his Knox Box apartment in a fire. Plato's was his favorite place to go eat, so once a year a group of us meet up and reminiscence. It is located in on Rte. 1 right outside of the University of Maryland campus. There is a free parking lot, and the closest metro stop is College Park on the Green line. We met up for lunch this year, however I forgot to take a picture of the outside, so I came back at night. The place isn't that big but then again most diners aren't. There are booths, some tables and some sort of ancient Greek decor. This is the main dining room, and it was actually really packed on this Sunday afternoon. The menu consists of everything from breakfast, Greek & Italian food, sandwiches, soup/salads, burgers, cakes, pastas, to seafood. I ordered the 'French Shorty - 4 French toast triangles' for $4.79. So good and cheap! I like how they give you individual maple syrup packets. I ate the entire thing really fast. Maybe I just have a thing for french toast now (see Firefly). We had a great server who was friendly, and everyone seemed to enjoy their food. Its a very casual place, however my only gripe is they won't let you split the check between multiple people before a certain time of day. So someone needs to pay for the whole thing, or remember to bring cash! The most expensive item is the 'Surf and Turf' for $22.99, however you can find food like I did for very cheap too. One cool thing is all baking happens on the premises. During the Super Bowl (yes I know it's a month late!) the bf and I hosted a party at our place and had a 'Wing-Off' amoungst his friends. There were 4 participants, and the rules were to create an original buffalo wing recipe, and have the rest of the party rate the wings to determine the winner. Look at how much chicken there was! Then when almost done cooking with like 5 minutes left.. topped it off with a little bit of shredded pepperjack cheese." Pan-fry with SSO & Garlic, then put the chicken and everything else in a pot and simmer." Sriracha (crazy chicken brand) mixed with franks red hot sauce. Personal Hot Marinade (Spices, Peppers(Scotch Bonnet/Jalepeno)) Its damn near 15 years old so whatever I've put in there over the past decade. This is where the unique flavor of the sauce is achieved the above ingredients are more of a base to work from for good hot wings. Added the sauce to the wings before serving to prevent soggy wings . And finally, love. I know how I like my wings so thats what I tried to serve, keep the meat clean and not wet, cooked thoroughly." And the Winner is..... #1!!! Check the presentation too! The winning order was #1, #4,#3, then #2. All the wings were great and it was really fun to taste them all. Hope to have another sort of contest soon!